Founder of the Brisbane International Contemporary Dance Prix. In October 2018 a significant new event took place on the Australian dance calendar. 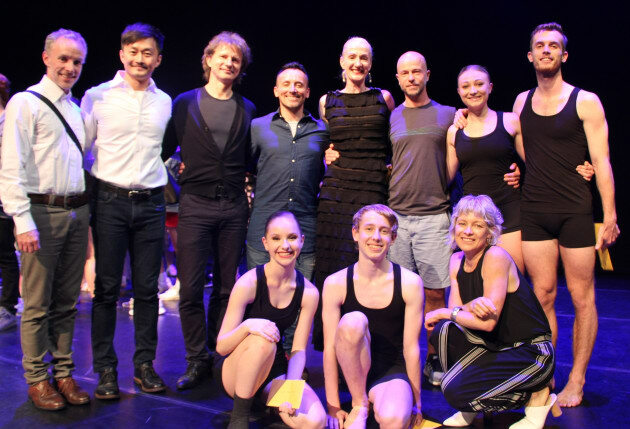 For the first time in Australia, and quite possibly the world, an international “competition” dedicated purely to contemporary dance was held. Founded as an international competition it attracted choreographers, adjudicators and participants from around Australia and overseas. I placed the word “competition” in inverted comma’s because, while the Brisbane International Contemporary Dance Prix (BICDP) is indeed a competition which seeks to reveal the best in contemporary dance, the awards are opportunities: placements in high-end finishing schools, secondments to companies, offers to work with choreographers on project pieces and in some cases full employment contracts offered. The BICDP is the brain child of renowned Australian dancer, teacher and choreographer Louise Deleur, and MDM Dancewear were proud to be associated with this endeavour from the point that it was little more than a great idea and a passionate plan on the cusp of blossoming. Now the first of what we hope will be many annual events has concluded, we caught up with Louise to get her thoughts on the process: the why, the how and what she’d do differently. Josef - Hi Louise. So how was the week? I’ve been hearing really amazing reports back. Louise – It was a great week. The students were so respectful, their energy was focused and professional. There was no-one standing around slouching or slacking off. They were really energized, working and listening and part of that was because they appreciated the kind of calibre of the people that were in the room with them; the choreographers, directors and coaches. It was also great to see improvisation come off so well. When I first started talking about the improvisation section with Linda [Louise is here referring to Linda Gamblin, Head of the Sydney Dance Company Pre-Professional Year and one of the invited adjudicators] she was a little concerned we might just get a lot of, ‘chasse pas de bourree into pirouette’, but we didn’t. They all committed to it and it went really well. Why do you think Linda might have been specifically concerned about that? Louise - I think her concern and it’s a really well-founded concern, that often when people get nervous they tend to revert back to ballet steps and taught movement phrases that makes them feel a little more comfortable and secure. But because we spent the whole week working on tasks, it broke them in and got them comfortable, so in the end they responded really well when they came out on stage. A lot of studios do more improvisation work now too, and it’s even part of more Eisteddfods, so perhaps dancers are becoming more used to that as a process. But I really should start at the beginning, so let me jump back a little: what made you want to start this Brisbane International Contemporary Dance Prix? Louise – I think the main was reason was that I find that the Eisteddfod scene - and I’m generalising here - often doesn’t really reflect the headspace of the professional world. A lot of the dancers, and the work performed in that sphere doesn’t represent contemporary dance properly. It’s a lot about show us your tricks and what contortions you can do in a little over a minute and it’s not really doing justice to the artform and what is involved in being in a contemporary company. “Not doing justice to the artform”; can you unpack that a little more? Louise –There are a whole range of things that make a good dancer and it’s not just about their physicality and trick list. It’s about the quality of how they do something, it’s about the intention they have behind it, about how they’re able to be a whole person on stage and bring a quality to their performance. There needs to be depth as a performer, and that’s across all artforms not only dance, and I’ve felt like people are becoming more intent on doing tricks and not having the movement connect, not focusing enough on the person you are between and through the steps. And so I wanted to create the headspace that would reflect that of a professional company, not of an Eisteddfod two-minute solo. What did you do differently; how did you structure that to make that work? Louise – By the quality of the professionals that I brought in and having the Prix develop over a week. It’s not just about two minutes on stage in the solo. When you’re in a company, or you’re wanting a job, if the Director wants to employ you there are so many things you have to be to be employable. You have to have the right head space; you have to be able to work in a group and collaborate well, you need to be able to take on corrections and suggestions, you need to be able to work as the choreographer wants, but then you need to be able to task alone and develop ideas to offer, so it’s much more than just the final product on stage these days. When a Director is looking for a company member they’re typically assessing for so many layers that go to making up a company member. A lot of companies have traineeships now. There are so many levels you have to pass through to get a company contract because a Director really wants to know who the dancer is, what they’re getting and how that person will add to the dynamics of the company. So I was trying to give dancers a taste of that environment, a taste of the whole work process of being in a company; what it takes to train and create work. And on top of that, I have so many dancers come to me who are really nicely trained, but may not have the perfect ballet body, yet are really good movers and don’t know what to do, where to go, what the pathways are. So it was about trying to create opportunities for them to connect with choreographers and Directors in order to try and get people jobs and inspire them through contact with other contemporary opportunities outside of Australia. And how did the BICDP achieve that aspect? Louise – We had a panel of adjudicators and coaches come from all over the world. That was the first part. On one day we had an afternoon of open conversation with all of the Directors and coaches, which was a really good breaking down point. We all sat on the floor at the same level and the Directors talked about what they wanted in a company member, about processes for training and developing work and I think that was really informative. I think that sometimes when you’ve lived through the process yourself, you forget how important some of that information is and if it’s not passed on, and even if it is passed on, hearing it from so many people at an Internationally recognised level reinforces it in a very powerful way. It was grounding and informative. I believe it also made those directors, choreographers and coaches all very human and approachable to the young dancers who can often find the step into the professional world very daunting. I think a lot of people aren’t sure about the pathways into contemporary dance. Contemporary dance has so many levels and different ways work is developed and performed; you have contemporary dance that is earthy and freelance based, contemporary dance as done in Classical companies, project work and even companies labelled ballet companies that are actually contemporary companies. So the Prix was trying to provide the dancers with a broader spectrum of what’s available. Who are you? What do you want? What are the pathways? How do you present yourself to get work? So apart from working with a whole range of different styles the dancers also received information about how to progress forward. It’s a big vision that you have for the Brisbane International Contemporary Dance Prix? [laughs with slight embarrassment] Louise - Yeah. It’s a vision to educate and inspire, but not only for the dancers, but also for the teachers and the choreographers and the Directors who came to connect and share with each other. And the overall energy of this long term, is to hopefully inspire people and to continue to build audiences for contemporary dance. Do you feel that contemporary dance struggles for an audience? Louise – I think so. I think most companies would tell you that. Why do you think they struggle? Louise – I think it’s partly up to choreographers not to forget that we’re also part of the entertainment industry. I think, [At this point Louise pauses, working harder to choose her words carefully, almost pitching into each word one at a time, as though picking through a hundred previous conversations to source the best way of articulating her next thoughts. It comes across as a key point of conflict for her, something that perhaps isn’t fully resolved in her own mind] we, also need to create work that inspires and … entertains – that’s the key word for it I suppose – audiences. And I sometimes think that contemporary dance doesn’t hold that level of interest or entertainment. Another word for “entertainment” in this context might simply be engagement. We want audiences to feel personally engaged and perhaps they’re not right now. Or not enough. If you’re going to put something on in the public sphere you have to have a reason for thinking the public might be engaged and interested in it, otherwise you may as well just do it for yourself. Louise - So I think contemporary dance needs to be a little aware of that because I’d like us not always to be the poor sister to ballet. I don’t see why we have to have so many independent artists struggling all the time. I‘d really like to see a culture where great and inspiring contemporary works are being produced and the audiences are developed and engaged and the dancers can find a home and not have to continuously worry about how they’re going to pay their rent next week. I want to see it blossom. I could unpack this part of the conversation forever, but let me segue back and ask; what do you think were the most successful elements of the BICDP? I would potentially like to add on some teacher education and training to the week and perhaps satellite workshops and classes for other dancers who come to watch. So your answer has pushed into my next question, and I know the event has only just finished, but what would you want to do differently looking forward to 2019? Louise – Getting the structure and timetable tweaked as there are always small issues. It ran rather smoothly for its first year and it was fantastic to have the support of QUT Creative Industries. In 2019 I am working towards hopefully having all the studios in the one building so everyone is in the same building for a little more morning collaboration. The industry talks were really beneficial so perhaps there’s some scope to extend and build on those. [Here Louise pauses and laughs again] What I’m really thinking about is how to get the $30,000 sponsorship again! That’s always the challenge! [she segues back to the topic] We’ll be looking for more collaboration with companies and Universities with dance programs. Now they’ve seen how it works and how successful it can be the hope is that more people will be inspired to be involved. And I’d like to develop more schools and companies from overseas to come and attend to make it increasingly a truly international event. Josef - From my talks with people post this event it’s clear that the Directors, teachers, audiences and participants were keen to say how inspiring and successful the inaugural Brisbane International Contemporary Dance Prix was and how important it was for our contemporary dance industry. It’s clear that Louise has a vision that is vast for what this event can achieve and for what more can be done for contemporary dance generally. Her passion and knowledge of the industry is expansive and MDM are proud to support this vital, informative and inspiring event.